Still available as charted tapestry. A fabulous keepsake for any newly-weds. Shown here made up with a fabric border; a joyful celebration of the big day, complete with vintage style confetti. Not too big, so it will be quick to stitch and you will have it finished in time for the wedding. 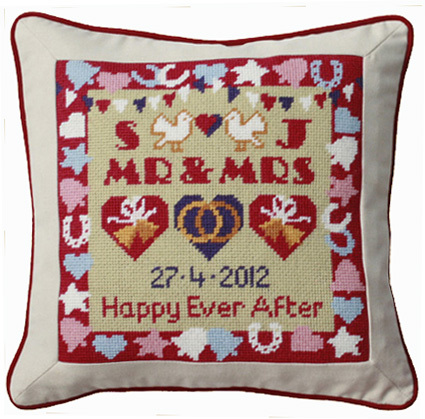 Plenty of room for personalisation – the initials at the top are optional – Add the date, then you can choose “Happy Ever After” or add the church or wedding location. Alphabet and number charts included in the kit. Make it up as it is for a small decorative cushion or add a fabric border for a more substantial one.